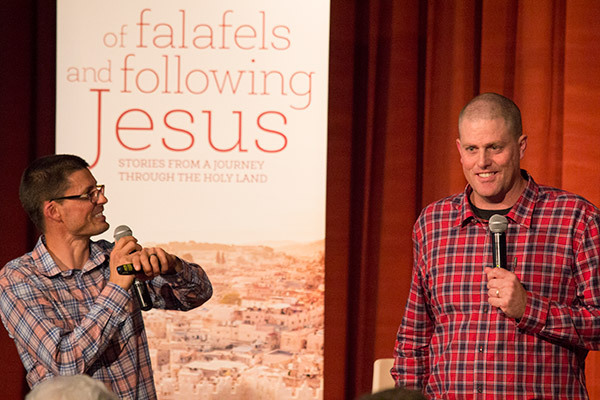 Of Falafels and Following Jesus describes and reflects on a journey through Jordan, Israel and the Palestinian Territories that the authors—Signs Publishing Book Editor Nathan Brown with Avondale College of Higher Education alumni Michelle Villis and Brenton Stacey—took in October this past year. To write Of Falafels and Following Jesus, Brown joined a group led by pastor, author and Holy Land tour leader Dr Peter Roennfeldt, also an alumnus of Avondale. Brown invited fellow group members—Villis and Stacey—to share some of their reflections as first-time visitors to places including Jerusalem, Petra, Bethlehem and the Sea of Galilee. The first launch event took place on the afternoon of March 16 at Fox Valley Seventh-day Adventist Community Church as part of a weekend of meetings led by Roennfeldt that also included those from the neighbouring Wahroonga church. At the launch, Roennfeldt spoke about “Assumptions, Myths and Reading the Gospels Better” and reflected on how spending time in the places in which the Bible stories took place can change how we read and apply these stories. The afternoon program also featured a video of the trip created by the tour group’s youngest member, Lucy Geelan from Newcastle. Her travel to the Holy Land came courtesy of the Seventh-day Adventist Church in Australia, which offered a spot in the tour group for the winner of a filmmaking competition it sponsored. “Lucy’s video is very nicely made, but I was quite stunned by how well it resonates with some of the key moments and ideas in our book,” says Brown. Celebrations continued that evening at Avondale College Seventh-day Church in Cooranbong. The launch there included a premiere screening of an episode from Following Jesus: Multiplying Disciples—a 10-part series filmed on location in Israel, Jordan and Turkey. Presenter Dr Nick Kross, a member of the Seventh-day Adventist Church in the South Pacific’s Discipleship Ministries Team, introduced the series, as did filmmaker Wes Tolhurst who had produced a video message of himself addressing Brown. Of Falafels and Following Jesus is available from Seventh-day Adventist bookshops in Australia and New Zealand. Watch the Following Jesus: Multiplying Disciples video series. Watch Lucy Geelan’s Holy Land tour video.